Is Florida's "Stand Your Ground" Law in Constitutional Crosshairs? Is Florida’s “Stand Your Ground” Law in Constitutional Crosshairs? In 2017, Florida lawmakers made some critical changes to the state’s Stand Your Ground law. This year, the state’s highest prosecutors are preparing to argue to the Florida Supreme Court that these changes violate the U.S. Constitution and render the law void. There may be many changes in store for the Stand Your Ground law if it is declared unconstitutional. What Makes Stand Your Ground Different from Traditional Self-Defense? Self-defense can be a viable defense to a charge of murder, manslaughter, or reckless homicide. If you’re in immediate fear for your life or the life of a bystander, you’re legally empowered to take whatever steps you need, up to and including killing your assailant, to escape harm. But in most states, self-defense is raised as an affirmative defense, which means the defendant bears the burden of proving that a lethal threat was imminent. Florida’s Stand Your Ground law flips the burden of proof from the defendant to the prosecutor. That is, instead of requiring the criminal defendant to put forward proof that he or she acted in self-defense, the prosecutor must show—through “clear and convincing” evidence—that this killing wasn’t in self-defense. Because this can sometimes be tantamount to proving a negative, many have criticized Florida’s law as providing a safe haven for those seeking vigilante justice. Since the most recent amendment to the Stand Your Ground law, criminal defendants and prosecutors alike have challenged its application. Defendants who were criminally charged before the Stand Your Ground law took effect argue that they should be able to take advantage of its burden-shifting provisions to escape criminal liability; prosecutors argue that the law oversteps its bounds by requiring the issue of self-defense—formerly a jury claim—to be decided by a judge alone. Recently, the Third District Court of Appeal in Miami-Dade County held Stand Your Ground to be constitutional but determined it could not retroactively apply to charges levied before it took effect. This case has been appealed to the Florida Supreme Court, the ultimate arbiter of whether state statutes violate the Constitution. The End of Stand Your Ground? Even if the Florida Supreme Court does determine that Stand Your Ground is unconstitutional, it’s likely this law will be modified rather than eliminated. Many of Florida’s other criminal laws carry far stiffer penalties than those of states without a Stand Your Ground equivalent, so scrapping this law might require a comprehensive overhaul of all state criminal statutes. 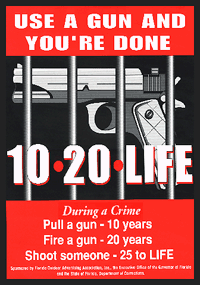 For example, Florida’s 10-20-Life law is a sentencing enhancement that imposes mandatory minimum sentences (ranging from 10 years to 20 years or life in prison) for certain gun-related crimes. Being able to escape conviction on a gun-related crime by invoking Stand Your Ground can prevent the 10-20-Life law from ever coming into play. Previous Post: Is Florida's Ban on Smoking Medical Marijuana Unconstitutional?